Experience African Simplicity in Rural Kenya! Maili Saba Camp is a sanctuary of tranquility and conviviality that rejects the rigidity of modern life. Tucked away on the edge of the magnificent, dormant, Menengai Crater, accommodating only twenty pampered guests at a time. Maili Saba Camp embraces a warm casual atmosphere within African Simplicity. Whether you will visit us on your way to the northern/ western frontier or come for a weekend out you will leave refreshed and inspired by nature just twenty minutes out of Nakuru town. 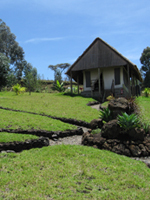 Maili Saba Camp offers a comfortable, relaxed and secure environment where we do our level best to suit your every need.